Candleberry Candles :: Miscellaneous :: Candleberry Inc.
Family traditions, and family endeavors, often originate in homes where fathers, mothers, children, and friends gather to share their affection, their memories, and their plans for the future. The Candleberry Story originated in the home of Ernie and Jan Fowler of Frankfort, Kentucky, with their son Neal and daughter Lisa. Our story begins in 1981, when the Fowler family owned and operated several retail stores. Jan’s natural affinity for the sale of fragrant goods—such as candles, potpourri, tarts, spray, etc. made the businesses successful. In running these businesses, Jan came to realize that items with a strong but pleasant scent sold best. Ernie, looking at her receipts, drew the same conclusion. However, Jan often encountered a problem with her candles; some of the major candles Jan sold had strong scent in the top layer of the candle, but the aroma declined as the candle burned. In addition, the candles often created smoke. It was difficult to obtain quality products that burned with a consistent, smoke-free smell. Jan and Ernie looked for a way to resolve this problem. If they could make their own candles, then they could control the quality and make sure the fragrance was distributed evenly and strongly throughout the product. They began by visiting other candle factories, from small mom & pop candle makers in the Smoky Mountains to a large conveyor belt operation in the North. The Fowlers decided they could make a better candle, and after discussions with the rest of the family, they moved forward with their plan. Family meetings at the Fowler’s house resulted in the name “Candleberry.” They decided to place the first candle-making operation adjacent to their first retail store in Frankfort, Kentucky. When other stores learned of Candleberry’s candles, the business began to take off. Another major factor in growth of the business was the Internet. The immediate popularity of the Internet led Neal, the Fowler’s son, to suggest the establishment of a website for the company. Today the company manufactures and markets thousands of high quality, aromatic candles. Each member of the Fowler family made unique contributions to the business. Ernie and Jan brought management and marketing expertise. Lisa’s skills in art were important in designing labels and marketing materials. Moreover, her penchant for colors and fragrance development was essential. Neal’s business education and experience enabled the company to effectively manage the financial aspects and the production. Many of the Candleberry names and scents have a story involving friends behind them. One involves a beloved sales representative (Terry Copp--deceased many years ago). Terry enjoyed cocktails, and his love of bourbon led him to suggest that the company make a bourbon candle with its own unique color and fragrance. “Call it Kentucky Bourbon,” he said. Ernie replied, “It’ll never sell.” Despite his reservations, Ernie asked Lisa to design a scent and color just as an experiment. The candle sold… and then sold, and sold, and sold. 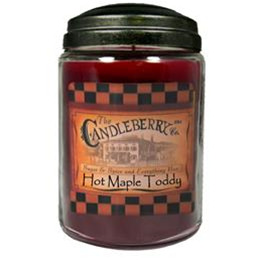 To this day, it is one of Candleberry’s best-selling candles and is now a hallmark candle for several local bourbon distilleries. There is yet another special story behind the “Friendship Tea” candle. At “The Candleberry Tearoom”, a small restaurant owned by the Fowlers, Jan would invite several of her friends to visit for “afternoon tea.” This subsequently inspired the candle “Friendship Tea”, and its fragrance with spices and other sweet scents.